The first image from Sin City 2 were just released and while they’re really annoying me (Chris Meloni, really? Josh Brolin as Dwight? And do we really have to have Bruce Willis back again, Hartigan is in jail the entire run of the series, and then dead) it’s also reminding me of Boys, Binghamton and more bad hair. In never knowing what to do with my hair, I always just pointed to someone prettier than me and said “I want that.” When I was living in NYC the year after graduation, “that” was Carla Gugino’s sleek Sin City bob. I was working for MaxSpa, which was the worst, most-stressful job I ever had, where even the free manicures and haircuts couldn’t make up for the stress I endured from the insane people who ran it. Sin City was my life for the better part of two years. I saw it four times at the Lowes Theater in Binghamton, once with Ian, once with Catch, once with MDS and once with Anthony. Two of those shows were in one weekend, which caused me to dream in black and white, which is the coolest thing in the world. The only good thing about working a summer at the now-defunct Movie Gallery was that I got it before anyone else had it, and watched it twice the night it came out. It was the first time I could imagine myself into the role of a glamorous dame, a femme fatale, a beautiful, deadly woman. It was also right around the time I was getting into Tom Waits and Raymond Chandler, luring me into this world of gorgeous decay. Movie buffs that Catch, Mike and I were, we inserted ourselves into that world. Mike and I were Marv and Wendy, cool-headed partners in crime who would always back the other up in times of vengeance. We still are, to a certain extent, although age, distance and circumstance have weathered most of our revenge-worthy causes. But I know right now if I called Mike and said, “Grab a shovel and meet me out past the airport,” he’d be there AND remember to bring Hefty bags, because Mike is practical and always prepared. But Catch and I were Dwight and Gail. The Catch I knew could brood like nobody’s business, but he only did it in front of me. Noble and dark-minded, Catch also had a spot-on Clive Owen inflection. And I was sharp-tongued, mean to his girlfriends, loyal to a fault and could absolutely rock wedges and a black halter. More importantly, the two of us had a fire. A fire the world had no place for. We were young and brash and terrified at the world that was open to us. And when that world didn’t want us, we built our own. We wrote a crime novel together. You can still find pieces of it online and around, a couple issues of Hardboiled, some anthologies. The character Jack was written for him (Roderick was written for Mike). It was a fire that carried us through hunger, fatigue, long hours at crappy jobs, breakups, good movies, bad wine and the relentless crush of a world that just didn’t get us. But as deeply as we felt the movie, the Carla Gugino haircut didn’t exactly work for me. I have cocktail waitress hair that flips out unless it’s held down by a series of steamrollers and two left hands which usually ends in me stabbing myself with either the brush or the hot iron. Bu I only had one picture of it in it’s perfectly curled glory. Catch’s parents took it at JFK just moments before he got on a plane bound for London. I’m wearing a Morbid Threads wiggle dress that doesn’t fit great and he’s got on a red v-neck tee-shirt. We’re both smiling despite the fact that my heart is shattering like a Tiffany Lamp dropped from the top of the Library Tower. He was gone for what seemed like an endless semester and every night for the first two weeks I watched “The Big Fat Kill” and cried myself to sleep in a shirt he had lent me just for that purpose. I’ve since lost that photo. 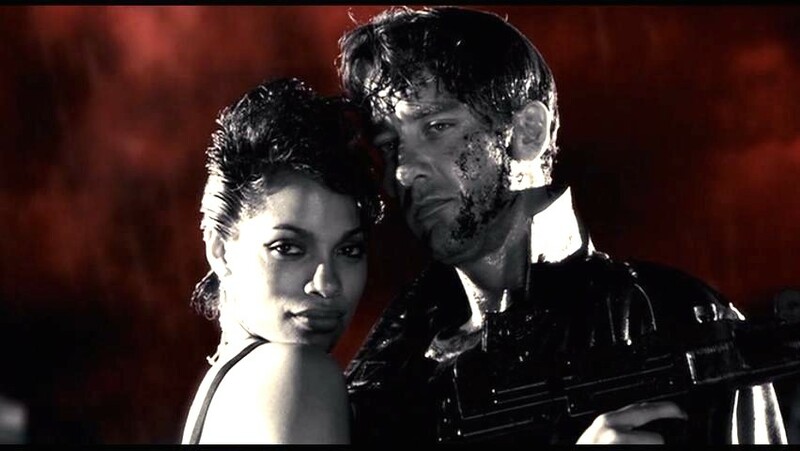 And I haven’t watched Sin City since. Catch and I lost touch a while later. “Lost Touch” is kind of a nice way of saying we broke each other’s hearts in an act of violent emotional murder/suicide. You know how in action movies there’s usually a scene where the hero and the villain wind up with their guns pressed against each other’s foreheads? That was Catch and I, only the guns were aimed squarely at the other’s hearts. It was an ugly, sordid thing and I regret it every *expletive deleted for Lent* day. There really was no place in this world for our kind of fire. But that didn’t mean it ever stopped burning. And I hope that wherever he is in this world with whatever new face he’s wearing, he’s seeing that same Sin City 2 news and remembering me the same way I remember him. I’m going to agree with Arlene on this one–dresses are awesome. But what I discovered are that dresses are an amazing way to be lazy. A sweater dress and leggings are just pajamas you can wear to work. Throw on a dress, loop a scarf around your neck and BAM, work ready, party ready, whatever ready. They’re an amazing garment, and men should be jealous that we get to wear them. I stood out in the freezing cold in a dress. I rummaged through a junkyard in a dress. I’m not going to throw away all my jeans, but this week has made me rethink the dress as a piece of clothing. Anything jeans can do, a dress can do better. Today would be the ultimate test of my dress-wearing stunt. I already gave up on the nightgown, but only because it tore in the armpit and I think Arlene would rather I slept in matching pink pajamas than in a torn nightie. 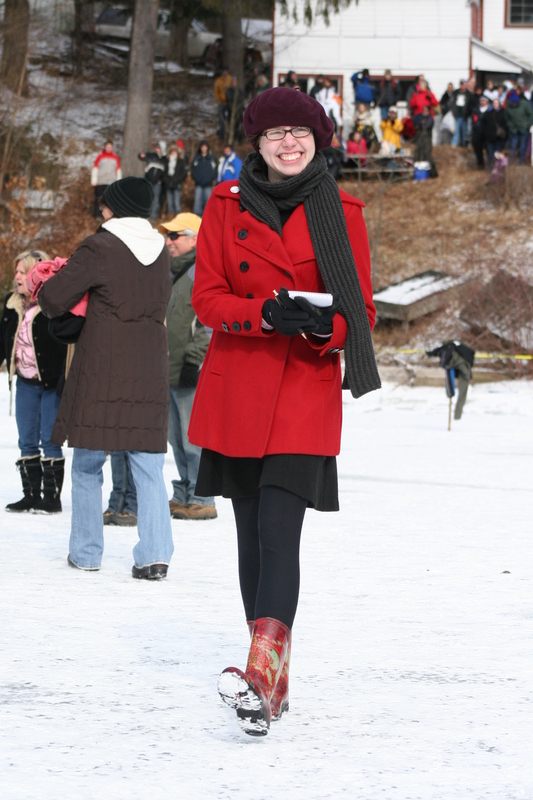 But today I had to spend two hours out on a frozen lake, covering the Polar Bear Jump for the paper. This is one of Ian and I’s big assignments every year; we plan part of our Christmas around getting warm clothes and accessories for the other just in preparation for these two hours. I didn’t even realize it was this weekend until I’d already committed to this stunt, but I had a plan . . . and better still, I had a dress. Silk undershirt, thermal shirt, black wool dress. Under Armor tights, cashmere socks, felted wool socks, galoshes. Hot Hands, Boot Warmers. Scarf, coat, gloves, wool beret. I couldn’t put my arms down, but at least I would be warm. And for awhile, I was. It’s impossible to stay toasty for two hours in 22 degree weather while standing on ice, but hey, at least I wasn’t jumping in freezing cold water . . . again. “Think of a new way to say “I Love You” every day” Arlene Dahl, Always Ask a Man. Isn’t that really what it’s all about? 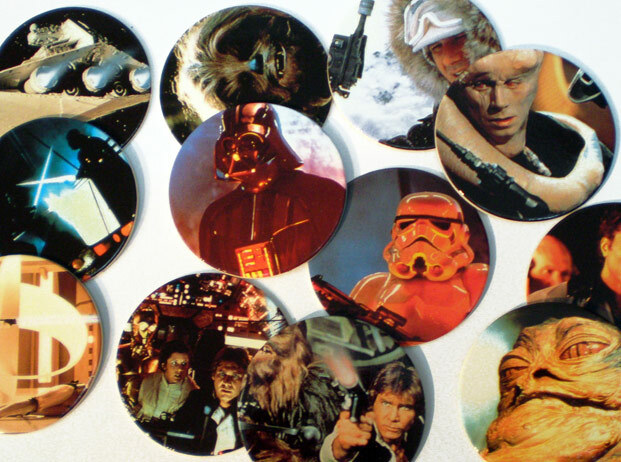 Yeah, I Had Star Wars POGS. ‘Cause I’m Awesome. I love Ash Wednesday. Growing up in a Jewish household (my mother converted when she married my XSD; though my father took us to the Presbyterian church) I was always jealous when one Wednesday, a whole bunch of Catholic kids would disappear from school and return an class period later with ashes on their forehead. I thought that was the coolest thing in the world, even cooler than POGS. So when I started going back to church a few years ago, I was overjoyed that they were doing imposition of the ashes. Growing up, I thought only Catholics got to get ashes. So I went and when Rev. Mark drew the cross on my forehead, a little thrill went through me. It was the thrill of doing something new, something that seemed forbidden and hidden when I was growing up. I gave up swearing for Lent. Not only for this project, but because I wanted to give up something I do every day that I truly enjoy. I could give up chocolate, yes, but I don’t eat chocolate every day. Swearing is something that is unbecoming in most company, clutters up my language, and makes me lazy. Already today I caught myself inserting an F-bomb into a just an ordinary sentence, and I stopped myself, and I felt good. There are better, more creative ways to express myself. And if I do swear, I’ll make a checkmark. Every check = $1, and on Easter Sunday, I’ll donate that much money to my church as my Easter offering. The hardest thing so far has been not wearing pajama pants. I have a romantic satin Victoria’s Secret nightshirt, but with no pajama pants, I can’t exactly lounge around downstairs with my Father-in-Law there. I stayed warm between two fluffy blankets, but when I got up in the night, by the time I got back to bed, my knees were chilled to the touch. Did I forget to mention I live in upstate NY? Yesterday was the 60’s, so today I decided that I was Veronica Corningstone and decided to wear my soft blue wrap sweaterdress. 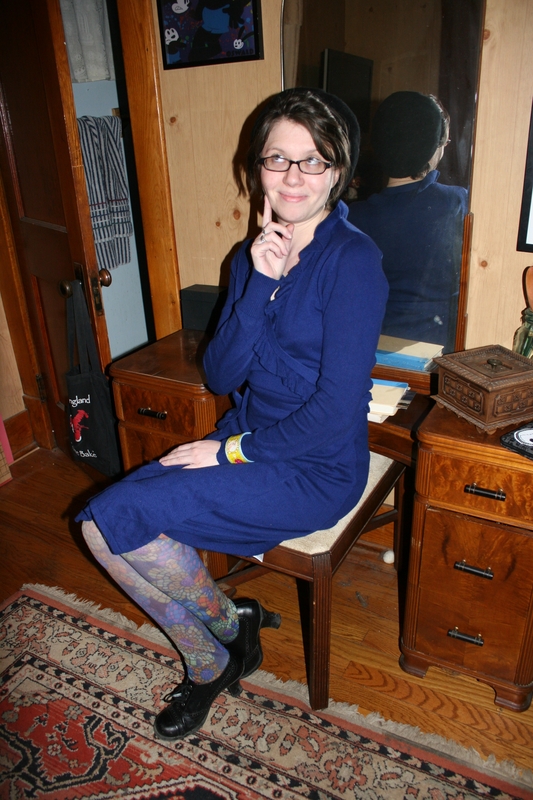 With it I wore stained-glass patterned tights, shoes like Velma Kelly’s in Chicago and a beret. A word about patterned tights–I’ve been rocking them for well over a decade. 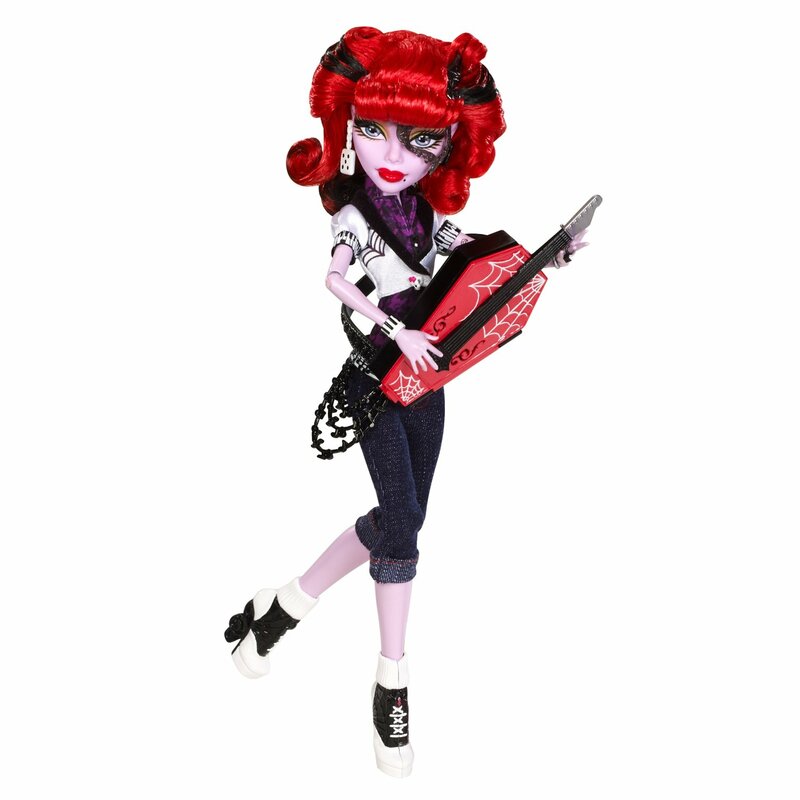 Back before you could get them at Claires, and only goth chicks wore stripes. My sister Shaun went to NYU, so when I went to visit, she would take me to the Sockman on St. Mark’s to stock up. Polka dots, pinstripes, wild blotches of color, bright red fishnets. For fancy occasions I had black silk thigh-highs with the seam up the back. 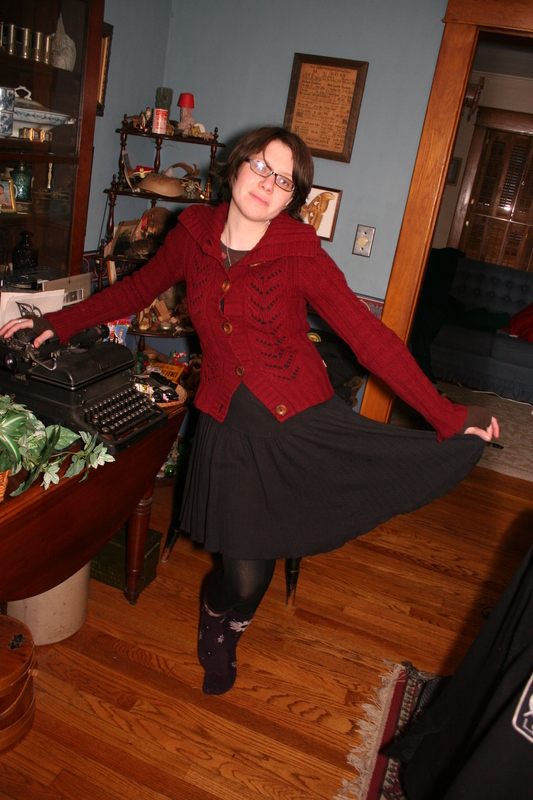 I wore these tights with a pleated skirt (that, for the record, still fits) and a sweater, because there’s this thing called the late 90’s, and it’s going to be around forever. However, the problem with wearing nylons is that your ankles get cold. No other part, just ankles. And cold ankles are a unique sort of misery. I wouldn’t recommend them.